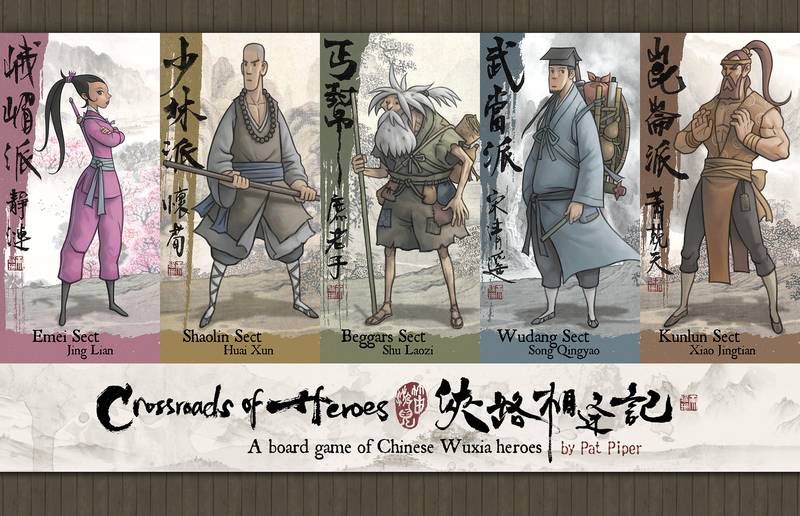 Crossroads of Heroes is a game by Patrick Lee, published by Pat Piper Games. It is for 2-5 players. In this game, players will take on the role of a Wulin hero as they try to return peace and honor to the Jianghu. They will have to train hard and perform many noble acts if they intend to obtain the mantle of Grand Master. In the end, the player that can gain enough renown through their deeds will become the Grand Master and be declared the winner. To begin, the board should be placed in the middle of the play area. Players should choose a character from the 5 main sects and receive the cards and character piece that belong to their chosen character. The player’s character card should be placed face up in front of themself. The basic techniques and sect signature technique cards are set aside face down. If using the optional sect guardian card, it is placed beneath the character card until used. The stratagems and items decks are shuffled separately and then placed face down in 2 separate piles near the board. The top card of both decks are flipped over and placed beside the corresponding deck to begin the discard piles. Each player is given a number of qi tokens equal to 3 + the number of players. Nemesis tokens, evil karma tokens and the extra qi tokens are set aside for later use. Each player is now dealt 3 stratagem cards face down. 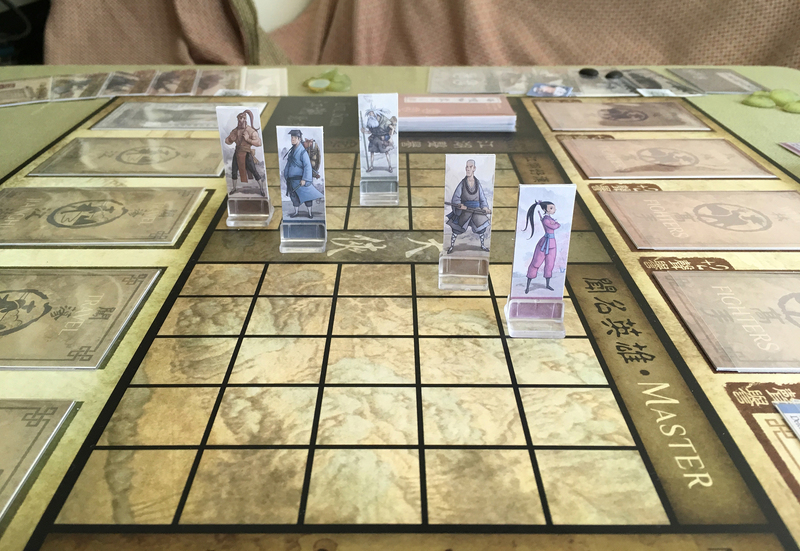 The 5 Wulin Master cards are placed face down on the top row of the board. The Travel Jianghu cards are placed face down on the bottom row of the board. Each player now places their character piece on the starting space of the reputation chart. The first player is chosen and play now begins. The game is played over a series of rounds. Each round players will take their turn. On a player’s turn they will complete a series of actions in order. First, they must draw a card from both the stratagem and items decks. One card is discarded to the appropriate discard pile and the other is placed in their hand. Next the player will resolve any actions or effects that were placed on their character during a previous turn. This includes completing the training of a technique, losing 1 qi if they were poisoned or skipping their turn if they were paralyzed. It should be noted that a player is able to play stratagem or items cards at any time during their turn, as long as they are able to meet the cards prerequisites. It should also be noted that a player is not allowed to play duplicates of the same stratagem card on a turn. Stratagems can be used to gain renown, attack opponents or any of several other actions. Items are single use items that can be used as a card action or sometimes even during a duel. Finally, a card is allowed to perform 1 primary action. 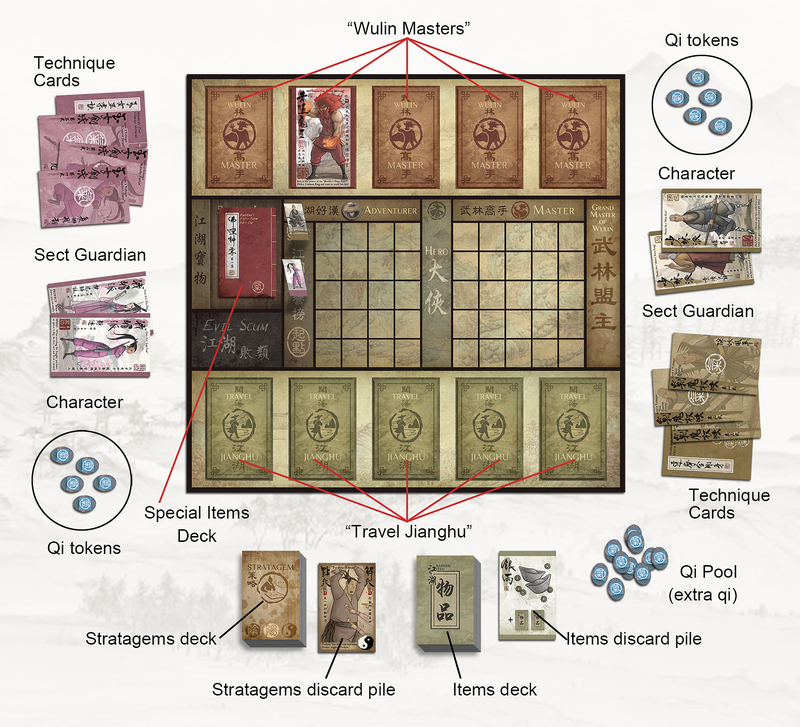 The primary actions are train a technique, duel with a player, travel the Jianghu, and challenge a top Wulin Master. The first primary action is to train a technique. To do this, the player places the chosen technique card face down beside their character. The player must then place the corresponding amount of qi displayed on the back of the card onto the card itself. The player must have at least 1 qi remaining after this is done or they can not initiate training. The training is completed during the next round. At that time, the qi is discarded to the qi pool and the trained technique is now turned face up beside the player’s character. It should be noted however that qi placed on a technique card can be depleted prior to the completion of training due to certain stratagem effects or duels. If the player does not have enough qi to complete the training after these events happen, then the training will not be completed and will have to be continued into the next round. It should also be noted that sect basic techniques must be trained in a specific order, starting with level 1 and continuing upward from there. The next primary action that can be taken is to duel with a player. To do this the player must initiate a challenge to another player. The defending player can not refuse and must take part. Players compare their wugong rating from the combination of their character card and any trained techniques that they might have. The player with the higher rating wins, gaining a set amount of renown in the process, depending on the rank of the player defeated. It should be noted that if the winner is a nemesis to the defeated player, they do not gain renown. Also if the defeated player has a lower renown, the winner only gains 1 point of renown instead of 2. The loser is then forced to lose 1 qi for every 1-3 points that they lost the duel by. After a player has been defeated, the winning player becomes the losing player’s nemesis. To show this, the winning player gives the loser one of their nemesis tokens. To remove a nemesis token and thus be able to gain renown from a duel again, the losing player must either beat them in a duel or use the stratagem, “Forgiveness”. Another primary action for players to take is to travel the Jianghu. 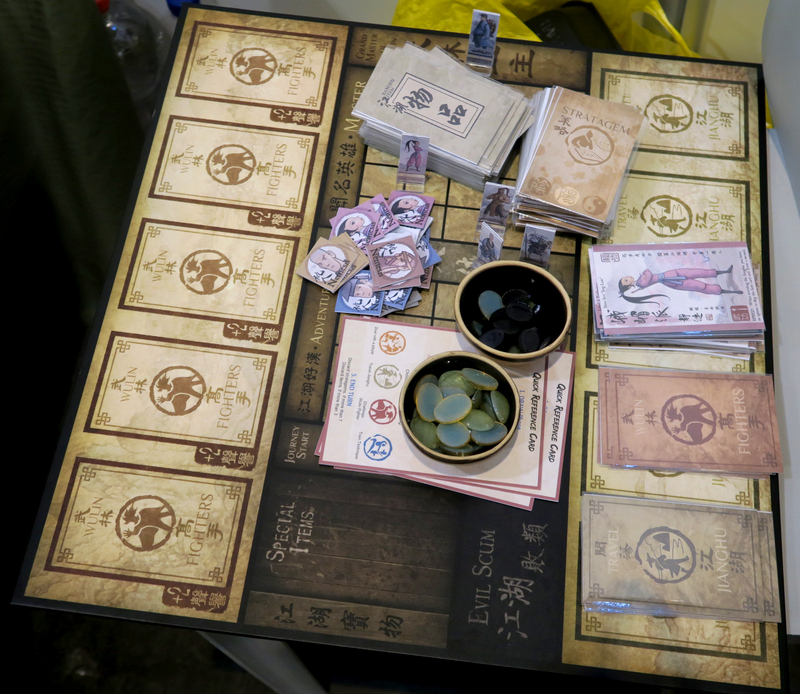 To do this, the player simply turns face up one of the Travel Jianghu cards at the bottom of the board. The card is then resolved based on the encounter or event that takes place. Once completed, the player must shuffle all the Travel Jianghu cards together and place them face down on the board again. These cards can grant increases in renown, initiate encounters to gain the character’s sect artifact or even be forced to duel the wandering duelist. The final primary action available is to challenge a top Wulin Master. To do this, the player simply chooses one of the five Wulin Master cards at the top of the board and flips over the card. Dueling is the same as with dueling a player, the player compares their character’s wugong rating with that of the revealed Master. If the player defeats the Master, they receive renown points based on their rank. They also gain the special technique belonging to that Master as a bonus. The player takes the corresponding technique card from the Special Items deck placing it beside their character. The defeated Wulin Master is removed from the game. The remaining Masters are shuffled together and placed back on the board face down. A few things of note should be pointed out at this time. During the game some actions like playing certain stratagems, will result in the character gaining evil karma tokens. Once a character has gained their fourth token, their character card is turned over to the evil side. Evil characters can not be turned back. Their character piece is removed from the renown chart and placed on the “Evil Scum” zone. If the players are using the Sect Guardians, any unused ones and any sect special items of theirs are removed from the game. Another item of note is in regards to a character’s qi. If a character loses all their qi, either through training or injury during duels, they must seek the help of the Divine Healer. For the next 3 rounds, that player may only travel the Jianghu in search of him. If after the third round the player has still not been able to find the healer, their character is dead and the player is eliminated from the game. A few times throughout this review I’ve mentioned the Sect Guardians. These cards are optional and only for players who’ve had some experience playing the game. They can be used as a guardian to defend a player who is about to lose all their qi during a duel, or they can be used for the card’s text ability. Once they have been used, the Guardian is removed from the game. The game continues until a player has gained enough renown to reach the final rank and become the Grand Master. Once reaching the rank, the player must be able to stay there for an entire round. If other players are able to reach the same rank during that turn, they must duel. The loser of the duel will be forced to take a step back losing 1 renown, while the winner of the duel will retain the rank and become the Grand Master of Wulin. If a character has turned evil, they can win by killing all the other player’s characters. However if the Grand Master loses a duel to an evil character but remains alive, he will also lose 1 renown. If either of these instances occur, the player is declared the winner. Since this is only a preview of a prototype, I won’t go into a lot of detail here. What I can tell you though is that this is some of the best looking artwork that I’ve seen in a game. Each card has a unique artistic style that I absolutely love. The characters all have a different look and feel to them. Each stratagem and item card has a very thematic look to it. There are so many cards and each one is so thematic. Also included with the game are various tokens for poison and nemesis, as well as special half marble looking evil tokens and qi. The game also has reference cards and character standees, as well as a beautiful looking board. I’m telling you, if this is how good the prototype looks, I can’t wait to see what the finished product looks like. The only thing that I could even recommend at this point would be miniatures instead of character standees. Other than that, the game already looks gorgeous. In any case, the game is definitely headed in the right direction and should be amazing once it’s finished. I really think players will be amazed when they receive their copy. Just like the components, the rulebook is also a prototype copy. What I got was a bunch of papers bound together. There are lots of pictures and examples in the book. The rules start with explaining who the characters are and giving a bit of a back story and details about each one. Setup is next followed by detailed directions on how to play the game. From there the rules move into detailed pages on stratagems and items. Each card and item is explained in great detail. Next the rules focus on turning evil and explain abilities and reasonings behind each character’s turn. Sect Guardians follow that section and explain the rules for each of them. Finally the rules finish up with a nice FAQ section to tie everything together and clear up any issues. Reading through the rules I received, I didn’t really see anything that stood out as being an issue. I think for being a prototype everything looks pretty good. I understand from the designer that there have been some rules changes, some of which I’ve worked into the overview above. I’m sure there will be more revisions before the game goes into production. As it is, I’m happy with the look and feel of what’s already here. I really think that once the game goes into production, the rules will follow suit with the components and should be fantastic. This is a really great game. While playing, you get a great sense of the theme and story behind it. Each action you take affects your character and adds to their story. Once a player makes it to Grand Master, there’s a really rich story behind how they got there. Each technique learned increases the character’s strength making them more powerful and moving them closer to the goal. Duels are simple and quick. No need for tons of dice rolls and adding up numbers. I like how that each negative decision a player makes, moves that character one step closer to becoming evil. There’s a great feeling of adventure and growth to this game. For me, I compare this one to several different games. The theme feels a bit like Yedo with the rich narrative that your character goes through and the decisions that must be made. I also get that same thematic feel of exploration from Naruto Shippuden the Board Game. However for this one, the characters feel more personal and less of a carbon copy. Playing the game, I feel like I’ve stepped into a episode of Kung Fu with David Carradine. It’s just so thematic. Death comes quickly in this game, especially if you over exert yourself by training or dueling too much. I like that the designer has made it a little easier to be healed. I didn’t go into detail about this in my overview. Originally you only got a single card each round to find the healer, now he’s made it where each round you get an extra card. So for the second round, you get 2 cards and the third round you get three. That makes it a bit easier to come back and not die so quickly. This is just one change to a constantly evolving game. The designer is really working hard to make this the best game it can be. That said, I already like the game as it is. I can only imagine that it’s just going to get better as the kinks are worked out. I really like the theme and design of the game. I really think this game is going to appeal to many different play styles. Fans of worker placement games like Yedo or adventure games like Naruto Shippuden the Board Game should really enjoy this one. I highly recommend this one and can’t wait to see more. Crossroads of Heroes is a game of adventure and discovery with a very rich theme. The game isn’t a very long game to play. Most game sessions last from around 45 minutes to an hour, depending on the number of players. The prototype copy I received is gorgeous, as are the pictures I’ve seen of where the game is headed. The rulebook looks just as good and I really feel like when this game hits shelves, it’s gonna be a work of art. Even though the game is still going through revisions with the rules, the framework here is pretty darn solid. I really like the mechanics of how the game is played and the richness of the theme. The game really pulls you in through each decision that you make. I really enjoy how characters can go evil from a couple of bad decisions. I also like that there’s more than one path to victory. I feel like this game will appeal to a lot of players. Fans of worker placement games like Yedo or adventure games like Naruto Shippuden the board game should really enjoy this one. The design is solid and a true joy to play. Once it’s produced, I feel that it will make a lot of people happy. I highly recommend this game and can’t wait to see the finished product. Much respect for this one. Crossroads of Heroes is now available for backing on Kickstarter. Just follow the link below and you can back it right now. You can also find more information on the game, as well as videos and a web comic for the game, by checking out the link below. This entry was posted in Preview Reviews and tagged board, board games, card, card games, crossroads, crossroads of heroes, games, heroes, Lee, pat, pat lee, pat piper, pat piper games, patrick, patrick lee, piper. Bookmark the permalink.